The U.S. government told Japan they thought they could revoke the Sea Shepherd‘s non-profit status to help make a deal on whaling. The deal wouldn’t be totally bad: Japan would return to “sustainable small-type coastal whaling activities off the coast of Japan”–instead of raiding the southern seas of whales with flimsy excuse of “research.” That’s exactly the kind of whaling Sea Shepherd has been protesting, but should the U.S. play with a non-profit to appease Japan? Or were they just bluffing? The documents show that diplomats believed a whaling compromise was possible–with potential milestones at an Obama visit to Japan in Nov., 2009, and the failed whaling summit of 2010. The cables also show Japan completely frustrated and obsessed by Sea Shepherd, bringing up the group, which is featured on Animal Planet’s Whale Wars, at every opportunity. Two Japanese officials lean heavily on the U.S. to “take action” against Shepherd. One claims that they’re worried about safety, the other more boldy notes that “it would be easier for Japan to make progress” on a whaling compromise if Sea Shepherd were, basically, humiliated by the U.S. government. U.S. representative to the International Whaling Commission (IWC) Monica Medina is so optimistic about a compromise, she’ll “work towards” getting President Obama and the Japanese Prime Minister, who are set to meet Nov. 13, making some kind warm, fuzzy statement on how they’re going to work out their whaling differences. The U.S. wants “symbolic action by Japan, such as agreeing not to take fin whales this year.” Medina says Japan has room to cut the number of whales it takes–and use as a starting point the current actual catch, not their inflated quota. Medina outlines how Japan would practice “sustainable small-type coastal whaling activities off the coast of Japan. In addition, the GOJ [government of Japan] would no longer hunt fin or humpback whales in the Southern Ocean, and the United States would uphold domestic and international laws to ensure safety at sea.” Which basically means they’d somehow go after Sea Shepherd. There is request for “Post, at the highest possible level, is requested to discuss reform of the IWC” with Japanese officials. They want to overhaul they IWC since it has been a failure. The U.S. wants Japan to help pressure Iceland not to hunt fin whales (which would be exported to Japan). Japan basically blows the U.S. off and says that they couldn’t possibly use trade measures against Iceland. Then they get back to their favorite subject, the Sea Shepherd, and the U.S. basically blows Japan off, saying they’re still looking into it. 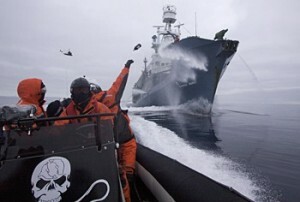 Also, Japan says Sea Shepherd is responsible for Japan not meeting its whaling quotas the last few years. What’s weird is Japan thinks taking away Sea Shepherd’s non-profit status would shut it down. I think it would have the opposite impact: the donations would flood in out of sympathy. How did sinking their boat work out? According to Charity Navigator, the group ran nearly a $3 million surplus in 2009 (and also gets good rating for not wasting money on administration expenses). Sea Shepherd gets a lot more direct help from the Netherlands, where it got 500,000 euros ($668,000) in the Dutch Post Code Lottery in 2009, a system set up to benefit environmental groups. I haven’t heard back yet from Sea Shepherd, but I’m guessing most of their donors wouldn’t be swayed by the U.S. tax status.